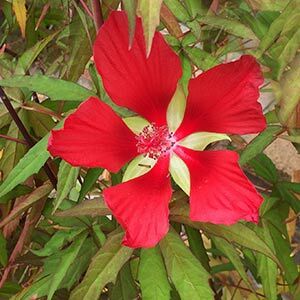 One of the more unusual water plants is Hibiscus coccineus, commonly called the ‘Water Hibiscus’ as well as the ‘Swamp Mallow’. Often sold as Hibiscus coccinea, however we believe H. coccineus is correct. This is a plant from the east coast of the USA, where it grows in wet areas and swamps. You could grow it from seed, however these are hard to come by. It is a herbaceous perennial so it will die right back in winter. Hibiscus coccineus is tall growing plant that grows in water. It will reach around 2m in height and with foliage that looks like that of a Japanese Maple looks great from spring though summer. This is a water plant, so submerge the pot in a pond or water feature. You can also grow it in any boggy or very wet ground with few problems. Best in a position where it is sheltered from strong winds and also given a little relief from the heat of the afternoon sun. As autumn comes around and the plant begins to die back it can be pruned right back to ground level. The plant has a naturally tall growth, so it will benefit from some pruning. In spring, it is beneficial to tip prune the first shoots. In early summer the plant will benefit from a little more tip pruning, this will result in more foliage, and more flowers will be the result. Fertilise in spring using water plant tablet type fertiliser. Propagation is easy by division, also possible from seed.